For organisms that grow in neutral pH environments, see neutrophile. Neutrophils with segmented nuclei surrounded by erythrocytes. Intra-cellular granules are visible in the cytoplasm (Giemsa stained). Neutrophil (also known as neutrocytes) are the most abundant type of granulocytes and the most abundant (40% to 75%) type of white blood cells in most mammals. They form an essential part of the innate immune system. Its functionality varies in different animals. They are formed from stem cells in the bone marrow. They are short-lived and highly motile, or mobile, as they can enter parts of tissue where other cells/molecules wouldn't be able to enter otherwise. 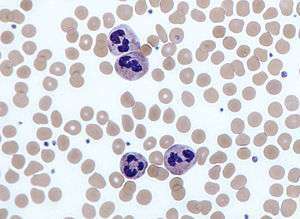 Neutrophils may be subdivided into segmented neutrophils and banded neutrophils (or bands). They form part of the polymorphonuclear cells family (PMNs) together with basophils and eosinophils. The name neutrophil derives from staining characteristics on hematoxylin and eosin (H&E) histological or cytological preparations. Whereas basophilic white blood cells stain dark blue and eosinophilic white blood cells stain bright red, neutrophils stain a neutral pink. Normally, neutrophils contain a nucleus divided into 2–5 lobes. Neutrophils are a type of phagocyte and are normally found in the bloodstream. During the beginning (acute) phase of inflammation, particularly as a result of bacterial infection, environmental exposure, and some cancers, neutrophils are one of the first-responders of inflammatory cells to migrate towards the site of inflammation. They migrate through the blood vessels, then through interstitial tissue, following chemical signals such as Interleukin-8 (IL-8), C5a, fMLP, Leukotriene B4 and H2O2 in a process called chemotaxis. They are the predominant cells in pus, accounting for its whitish/yellowish appearance. Neutrophils are recruited to the site of injury within minutes following trauma, and are the hallmark of acute inflammation; however, due to some pathogens being indigestible, they can be unable to resolve certain infections without the assistance of other types of immune cell. Neutrophil granulocyte migrates from the blood vessel to the matrix, secreting proteolytic enzymes, in order to dissolve intercellular connections (to the improvement of its mobility) and envelop bacteria through phagocytosis. Neutrophil granulocytes have an average diameter of 12-15 micrometers (µm) in peripheral blood smears. 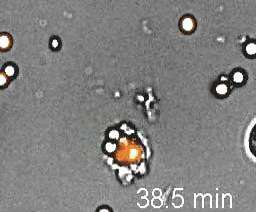 When analyzing neutrophils in suspension, neutrophils have an average diameter of 8.85 µm. Neutrophils will show increasing segmentation (many segments of nucleus) as they mature. A normal neutrophil should have 3-5 segments. Hypersegmentation is not normal, and occurs in some disorders, most notably vitamin B12 deficiency. This is noted on a manual review of the blood smear, and is positive when most or all of the neutrophils have 5 or more segments. Reference ranges for blood tests of white blood cells, comparing neutrophil amount (shown in pink) with that of other cells. 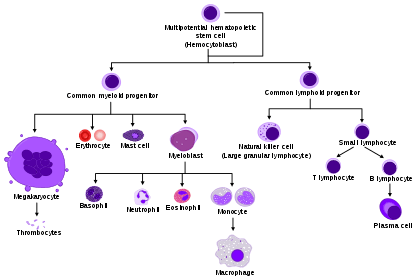 Neutrophils are the most abundant white blood cells in humans (approximately 1011 are produced daily); they account for approximately 50-70% of all white blood cells (leukocytes). The stated normal range for human blood counts varies between laboratories, but a neutrophil count of 2.5–7.5 x 109/L is a standard normal range. People of African and Middle Eastern descent may have lower counts, which are still normal. A report may divide neutrophils into segmented neutrophils and bands. 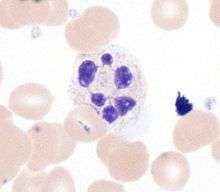 When circulating in the bloodstream and inactivated, neutrophils are spherical. Once activated, they change shape and become more amorphous or amoeba-like and can extend pseudopods as they hunt for antigens. Neutrophils have a preference to engulf refined carbohydrates (glucose, fructose, sucrose, honey, and orange juice) over bacteria. In 1973 Sanchez et al. found that the neutrophil phagocytic capacity to engulf bacteria is affected when simple sugars are digested, and that fasting strengthens the neutrophils' phagocytic capacity to engulf bacteria. However, the digestion of normal starches has no effect. It was concluded that the function, and not the number, of phagocytes in engulfing bacteria was altered by the ingestion of sugars. In 2007 researchers at the Whitehead Institute of Biomedical Research found that given a selection of sugars, neutrophils engulf some types of sugar preferentially. The average lifespan of inactivated human neutrophils in the circulation has been reported by different approaches to be between 5 and 90 hours. Upon activation, they marginate (position themselves adjacent to the blood vessel endothelium) and undergo selectin-dependent capture followed by integrin-dependent adhesion in most cases, after which they migrate into tissues, where they survive for 1–2 days. Neutrophils are much more numerous than the longer-lived monocyte/macrophage phagocytes. A pathogen (disease-causing microorganism or virus) is likely to first encounter a neutrophil. 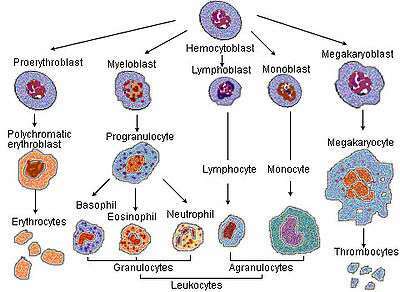 Some experts hypothesize that the short lifetime of neutrophils is an evolutionary adaptation. The short lifetime of neutrophils minimizes propagation of those pathogens that parasitize phagocytes because the more time such parasites spend outside a host cell, the more likely they will be destroyed by some component of the body's defenses. Also, because neutrophil antimicrobial products can also damage host tissues, their short life limits damage to the host during inflammation. 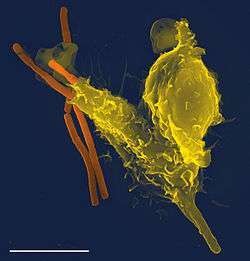 Neutrophils will often be phagocytosised by macrophages after digestion of pathogens. PECAM-1 and phosphatidylserine on the cell surface are involved in this process. 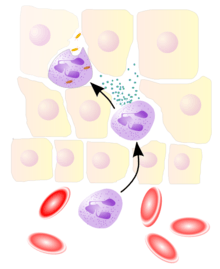 Neutrophils undergo a process called chemotaxis, which allows them to migrate toward sites of infection or inflammation. Cell surface receptors allow neutrophils to detect chemical gradients of molecules such as interleukin-8 (IL-8), interferon gamma (IFN-γ), C3a, C5a, and Leukotriene B4, which these cells use to direct the path of their migration. Neutrophils have a variety of specific receptors, including ones for complement, cytokines like interleukins and IFN-γ, chemokines, lectins, and other proteins. They also express receptors to detect and adhere to endothelium and Fc receptors for opsonin. In leukocytes responding to a chemoattractant, the cellular polarity is regulated by activities of small Rho guanosine triphosphatases (Rho GTPases) and the phosphoinositide 3-kinases (PI3Ks). In neutrophils, lipid products of PI3Ks regulate activation of Rho GTPases and are required for cell motility. They accumulate asymmetrically to the plasma membrane at the leading edge of polarized cells. Spatially regulating Rho GTPases and organizing the leading edge of the cell, PI3Ks and their lipid products could play pivotal roles in establishing leukocyte polarity, as compass molecules that tell the cell where to crawl. Being highly motile, neutrophils quickly congregate at a focus of infection, attracted by cytokines expressed by activated endothelium, mast cells, and macrophages. Neutrophils express and release cytokines, which in turn amplify inflammatory reactions by several other cell types. In addition to recruiting and activating other cells of the immune system, neutrophils play a key role in the front-line defense against invading pathogens. Neutrophils have three methods for directly attacking micro-organisms: phagocytosis (ingestion), degranulation (release of soluble anti-microbials), and generation of neutrophil extracellular traps (NETs). Neutrophils are phagocytes, capable of ingesting microorganisms or particles. For targets to be recognized, they must be coated in opsonins—a process known as antibody opsonization. They can internalize and kill many microbes, each phagocytic event resulting in the formation of a phagosome into which reactive oxygen species and hydrolytic enzymes are secreted. The consumption of oxygen during the generation of reactive oxygen species has been termed the "respiratory burst", although unrelated to respiration or energy production. The respiratory burst involves the activation of the enzyme NADPH oxidase, which produces large quantities of superoxide, a reactive oxygen species. Superoxide decays spontaneously or is broken down via enzymes known as superoxide dismutases (Cu/ZnSOD and MnSOD), to hydrogen peroxide, which is then converted to hypochlorous acid (HClO), by the green heme enzyme myeloperoxidase. It is thought that the bactericidal properties of HClO are enough to kill bacteria phagocytosed by the neutrophil, but this may instead be a step necessary for the activation of proteases. Neutrophils also release an assortment of proteins in three types of granules by a process called degranulation. The contents of these granules have antimicrobial properties, and help combat infection. In 2004, Brinkmann and colleagues described a striking observation that activation of neutrophils causes the release of web-like structures of DNA; this represents a third mechanism for killing bacteria. These neutrophil extracellular traps (NETs) comprise a web of fibers composed of chromatin and serine proteases  that trap and kill extracellular microbes. It is suggested that NETs provide a high local concentration of antimicrobial components and bind, disarm, and kill microbes independent of phagocytic uptake. In addition to their possible antimicrobial properties, NETs may serve as a physical barrier that prevents further spread of pathogens. Trapping of bacteria may be a particularly important role for NETs in sepsis, where NETs are formed within blood vessels. Recently, NETs have been shown to play a role in inflammatory diseases, as NETs could be detected in preeclampsia, a pregnancy-related inflammatory disorder in which neutrophils are known to be activated. In addition, NETs are known to exhibit pro-thrombotic effects both in vitro and in vivo. Low neutrophil counts are termed neutropenia. This can be congenital (developed at or before birth) or it can develop later, as in the case of aplastic anemia or some kinds of leukemia. It can also be a side-effect of medication, most prominently chemotherapy. Neutropenia makes an individual highly susceptible to infections. It can also be the result of colonization by intracellular neutrophilic parasites. In alpha 1-antitrypsin deficiency, the important neutrophil enzyme elastase is not adequately inhibited by alpha 1-antitrypsin, leading to excessive tissue damage in the presence of inflammation – the most prominent one being pulmonary emphysema. In Familial Mediterranean fever (FMF), a mutation in the pyrin (or marenostrin) gene, which is expressed mainly in neutrophil granulocytes, leads to a constitutively active acute-phase response and causes attacks of fever, arthralgia, peritonitis, and – eventually – amyloidosis. Decreases in neutrophil function have been linked to hyperglycemia. Dysfunction in the neutrophil biochemical pathway myeloperoxidase as well as reduced degranulation are associated with hyperglycemia. The Absolute neutrophil count (ANC) is also used in diagnosis and prognosis. ANC is the gold standard for determining severity of neutropenia, and thus neutropenic fever. Any ANC < 1500 cells / mm3 is considered neutropenia, but <500 cells / mm3 is considered severe. There is also new research tying ANC to myocardial infarction as an aid in early diagnosis. There are five (HNA 1-5) sets of neutrophil antigens recognized. The three HNA-1 antigens (a-c) are located on the low affinity Fc-γ receptor IIIb (FCGR3B :CD16b) The single known HNA-2a antigen is located on CD177. The HNA-3 antigen system has two antigens (3a and 3b) which are located on the seventh exon of the CLT2 gene (SLC44A2). The HNA-4 and HNA-5 antigen systems each have two known antigens (a and b) and are located in the β2 integrin. HNA-4 is located on the αM chain (CD11b) and HNA-5 is located on the αL integrin unit (CD11a). A rapidly moving neutrophil can be seen taking up several conidia over an imaging time of 2 hours with one frame every 30 seconds. A neutrophil can be seen here selectively taking up several Candida yeasts (fluorescently labeled in green) despite several contacts with Aspergillus fumigatus conidia (unlabeled, white/clear) in a 3-D collagen matrix. Imaging time was 2 hours with one frame every 30 seconds. Neutrophils display highly directional amoeboid motility in infected footpad and phalanges. Intravital imaging was performed in the footpad path of LysM-eGFP mice 20 minutes after infection with Listeria monocytogenes. ↑ Ermert D, Niemiec MJ, Röhm M, Glenthoj A, Borregard N, Urban CF (2013). "Candida albicans escapes mouse neutrophils". Journal of Leukocyte Biology. 94 (2): 223–36. doi:10.1189/jlb.0213063. PMID 23650619. ↑ Klebanoff, SJ; Clark, RA (1978). "The Neutrophil: Function and Clinical Disorders". Elsevier/North-Holland Amsterdam. ISBN 0-444-80020-4. ↑ Nathan, C (Mar 2006). "Neutrophils and immunity: challenges and opportunities". Nature Reviews Immunology. 6 (March): 173–82. doi:10.1038/nri1785. ISSN 1474-1733. PMID 16498448. ↑ Jacobs, L; Nawrot, Tim S; De Geus, Bas; Meeusen, Romain; Degraeuwe, Bart; Bernard, Alfred; Sughis, Muhammad; Nemery, Benoit; Panis, Luc (Oct 2010). "Subclinical responses in healthy cyclists briefly exposed to traffic-related air pollution". Environmental Health. 9 (64): 64. doi:10.1186/1476-069X-9-64. PMC 2984475 . PMID 20973949. ↑ Waugh, DJ; Wilson, C. (Nov 2008). "The interleukin-8 pathway in cancer". Clinical Cancer Research. 14 (21): 6735–41. doi:10.1158/1078-0432.CCR-07-4843. ISSN 1078-0432. PMID 18980965. ↑ De Larco, JE; Wuertz, BR; Furcht, LT (Aug 2004). "The Potential Role of Neutrophils in Promoting the Metastatic Phenotype of Tumors Releasing Interleukin-8". Clinical Cancer Research. 10 (15): 4895–900. doi:10.1158/1078-0432.CCR-03-0760. ISSN 1078-0432. PMID 15297389. ↑ Yoo, SK; Starnes, TW; Deng, Q; Huttenlocher, A (20 November 2011). "Lyn is a redox sensor that mediates leukocyte wound attraction in vivo.". Nature. 480 (7375): 109–12. PMID 22101434. ↑ Cohen, Stephen; Burns, Richard C. (2002). Pathways of the Pulp (8th ed.). St. Louis: Mosby. p. 465. ↑ Niemiec MJ, De Samber B, Garrevoet J, Vergucht E, Vekemans B, De Rycke R, Björn E, Sandblad L, Wellenreuther G, Falkenberg G, Cloetens P, Vincze L, Urban CF (2015). "Trace element landscape of resting and activated human neutrophils on sub-micrometer level". Metallomics. 7 (6): 996–1010. doi:10.1039/c4mt00346b. PMID 25832493. 1 2 3 4 Zucker-Franklin, Dorothy; Greaves, M. F.; Grossi, C. E.; Marmont, A. M. (1988). "Neutrophils". Atlas of Blood Cells: Function and Pathology. 1 (2nd ed.). Philadelphia: Lea & Ferbiger. ISBN 0-8121-1094-3. 1 2 Edwards, Steven W. (1994). 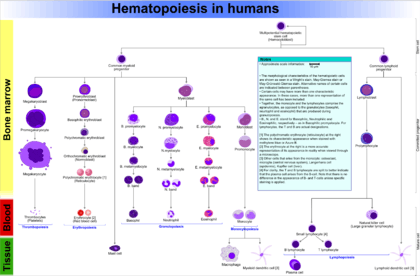 Biochemistry and physiology of the neutrophil. Cambridge University Press. p. 6. ISBN 0-521-41698-1. 1 2 3 4 5 6 Albert Sanchez; J. L. Reeser; H. S. Lau; P. Y. Yahiku; R. E. Willard; P. J. McMillan; S. Y. Cho; A. R. Magie; U. D. Register (1973). "Role of sugars in human neutrophilic phagocytosis". The American Society for Clinical Nutrition. Retrieved 2013-09-08. These data suggest that the function and not the number of phagocytes was altered by ingestion of sugars. This implicates glucose and other simple carbohydrates in the control of phagocytosis and shows that the effects last for at least 5 hr. On the other hand, a fast of 36 or 60 hr significantly increased (P < 0.001) the phagocytic index. 1 2 Rubin-Bejerano, I.; Abeijon, C.; Magnelli, P.; Grisafi, P.; Fink, G. R. (July 2007). "Phagocytosis by human neutrophils is stimulated by a unique fungal cell wall component". Cell Host Microbe. 2 (1): 55–67. doi:10.1016/j.chom.2007.06.002. PMC 2083279 . PMID 18005717. 1 2 Kneller, Alyssa (2007). "White blood cells are picky about sugar". Whitehead Institute. Retrieved 2013-08-09. ↑ Tak T, Tesselaar K, Pillay J, Borghans JA, Koenderman L (2013). "What's your age again? Determination of human neutrophil half-lives revisited". Journal of Leukocyte Biology. 94 (4): 595–601. doi:10.1189/jlb.1112571. PMID 23625199. 1 2 Wheater, Paul R.; Stevens, Alan (2002). Wheater's basic histopathology: a colour atlas and text (PDF). Edinburgh: Churchill Livingstone. ISBN 0-443-07001-6. ↑ Serhan, Charles N.; Ward, Peter A.; Gilroy, Derek W. (2010). Fundamentals of Inflammation. Cambridge University Press. pp. 53–54. ISBN 0-521-88729-1. ↑ Ear, T; McDonald, PP (2008). "Cytokine generation, promoter activation, and oxidant-independent NF-kappaB activation in a transfectable human neutrophilic cellular model". BMC Immunol. 9: 14. doi:10.1186/1471-2172-9-14. PMC 2322942 . PMID 18405381. ↑ Hickey, MJ; Kubes, P (2009). "Intravascular immunity: the host–pathogen encounter in blood vessels". Nature Reviews Immunology. Nature Publishing Group. 9 (5): 364–75. doi:10.1038/nri2532. PMID 19390567. ↑ Segal, AW (2005). 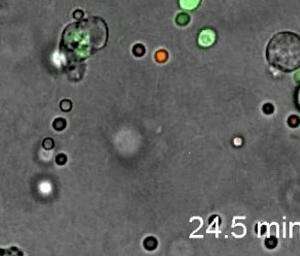 "How neutrophils kill microbes". Annu Rev Immunol. 9 (5): 197–223. doi:10.1146/annurev.immunol.23.021704.115653. PMC 2092448 . PMID 15771570. ↑ Ringel, Eileen (1984). "Localization of histaminase to the specific granule of the human neutrophil". Immunology. 52 (4): 649–58. PMC 1454675 . PMID 6430792. ↑ Urban CF, Ermert D, Schmid M, Abu-Abed U, Goosmann C, Nacken W, Brinkmann V, Jungblut PR, Zychlinsky A (2009). "Neutrophil extracellular traps contain calprotectin, a cytosolic protein complex involved in host defense against Candida albicans". PLOS Pathogens. 5 (10): e1000639. doi:10.1371/journal.ppat.1000639. PMC 2763347 . PMID 19876394. ↑ Clark SR, Ma AC, Tavener AS, McDonald B, Goodarzi Z, Kelly MM, Patel KD, Chakrabarti S, McAvoy E, Sinclair GD, Keys EM, Allen-Vercoe E, DeVinney R, Doig CJ, Green FH, Kubes P (Apr 2007). "Platelet Toll-Like Receptor-4 Activates Neutrophil Extracellular Traps to Ensnare Bacteria in Endotoxemic and Septic Blood" (PDF). Nature Medicine. Nature Publishing Group. 13 (4): 463–9. doi:10.1038/nm1565. ISSN 1078-8956. PMID 17384648. ↑ Gupta, AK; Hasler, P; Holzgreve, W; Hahn, S (Jun 2007). "Neutrophil NETs: a novel contributor to preeclampsia-associated placental hypoxia?". Semin Immunopathol. 29 (2): 163–7. doi:10.1007/s00281-007-0073-4. ISSN 1863-2297. PMID 17621701. ↑ Borissoff, JI; ten Cate, H (September 2011). "From neutrophil extracellular traps release to thrombosis: an overshooting host-defense mechanism?". Journal of thrombosis and haemostasis : JTH. 9 (9): 1791–4. doi:10.1111/j.1538-7836.2011.04425.x. PMID 21718435. ↑ Ozen, S (Jul 2004). "Familial mediterranean fever: revisiting an ancient disease". European Journal of Pediatrics. 162 (7–8): 449–54. doi:10.1007/s00431-003-1223-x. ISSN 0340-6199. PMID 12751000. ↑ Xiu, Fangming; Stanojcic, Mile; Diao, Li; Jeschke, Marc G. (8 May 2014). "Stress Hyperglycemia, Insulin Treatment, and Innate Immune Cells". International Journal of Endocrinology. 2014: 9. doi:10.1155/2014/486403. Retrieved 19 January 2016. ↑ Khan, HA; et al. (2012). "Blood cell counts and their correlation with creatine kinase and C-reactive protein in patients with acute myocardial infarction". Int J Clin Exp Med. 5 (1): 50–5. PMC 3272686 . PMID 22328948. ↑ Basili, S; et al. (2004). "Absolute neutrophil counts and fibrinogen levels as an aid in the early diagnosis of acute myocardial infarction.". Acta Cardiol. 59 (2): 135–40. doi:10.2143/ac.59.2.2005167. PMID 15139653. ↑ Chu HT, Lin H, Tsao TT, Chang CF, Hsiao WW, Yeh TJ, Chang CM, Liu YW, Wang TY, Yang KC, Chen TJ, Chen JC, Chen KC, Kao CY (2013). "Genotyping of human neutrophil antigens (HNA) from whole genome sequencing data". BMC Med Genomics. 6 (1): 31. doi:10.1186/1755-8794-6-31. PMC 3849977 . PMID 24028078.